Made-for-TV Movies & Music Videos. to take place in the fictional town of Pinkerton, Ohio. But in reality, virtually all of the show is filmed in L.A.'s San Fernando Valley. the local bully (Max) makes life miserable for the nice-but-nerdy teenager. 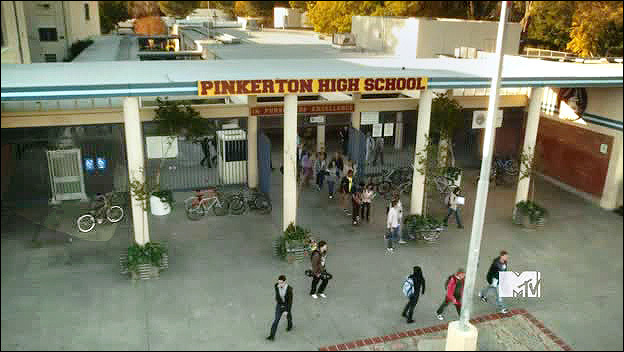 Those school scenes are actually filmed at Reseda High School, in the Valley. The address of the school is 18230 Kittridge Street, in Reseda, California. Nestle Ave. But they also have filed in the school's classrooms, cafeteria, athletic fields, etc. Van Nuys, West Hills & Northridge, where you'll find most of the show's other locations. Here is a Google StreetView of that familiar school entrance. So, you now know where RJ goes to school. So, where does he live? The house is about two miles northwest of his high school. Here is a Google StreetView of the house. so RJ moved out of the house and into his mom's blue apartment building. 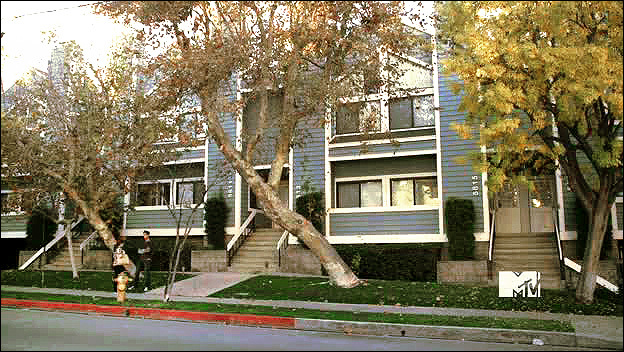 near-identical blue condos that line the west side of Etiwanda Avenue, in Tarzana, CA. But they seemed to mainly use the doorways labeled 5811-5813 and 5815-5817 Etiwanda . The condos are just south of Hatteras Street, two blocks north of the Ventura Freeway. and less than a mile south of his school. Here is a Google StreetView of the condos. a sleezy, cheap motel frequented by transvestite hookers and drug users. friends throw a big "Max -Bash" party (which, of course, Max crashes). online made it sound almost as bad as it is on the show. In real life, it's called the Movieland Motel, at 19335 Ventura Blvd, in Tarzana. It's on the north side of Ventura Blvd, less than a mile and a half west of the mom's apartment. since it's set back from the road, behind a wall, and it faces east, away from the street. The producers added a fake "No-Tell Motel" sign, in the back. The actual sign is in the front, out on Ventura Blvd. sold for land value alone ($1.8 million), and the motel will be torn down at sale. Remember the episode where RJ took Amy & Miles to a Weezer concert? And to get into that concert, they needed fake ID's. This is where he got them: Fidel's house. Coach Sinclair gave RJ the address, and it turned out to be in a rough neighborhood. They knocked on the door, and Fidel, a dangerous-looking guy, pulled them inside. On the show, the address was "1150 Chunte Street" (which Miles mispronounced). Balcom & Hatteras, about half a mile east of the mom's apartment. Google StreetView), helping to give the area the rundown look they were going for. The rest of the block looks like a pretty normal working class neighborhood. Finally we have two locations that are right across the street from each other. Remember the season finale where the guys went to the Fall Formal dance in a limo? RJ had managed to land his first date with the girl of his dreams, Jenny Swanson. The first location is the house where RJ picks her up, at her home. when he sees harmless RJ standing there, he tells him he has the wrong house. - and her mother somewhat puzzled. 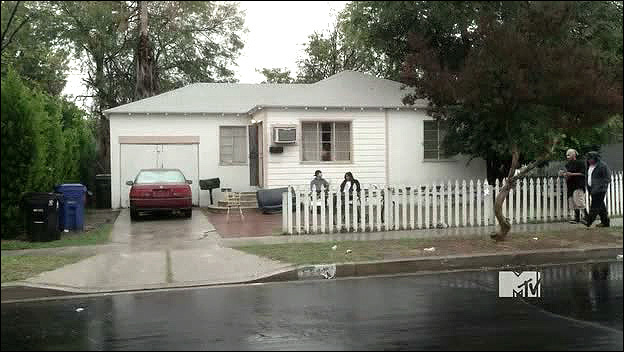 Jenny Swanson's house is located at 18630 Ringling Street, in Tarzana. You don't see much of it in the scene, just a little of the brick walkway, and the door. Here's a Google StreetView of the house. to try to take her to the dance. Both she and her parents ridicule poor Miles. 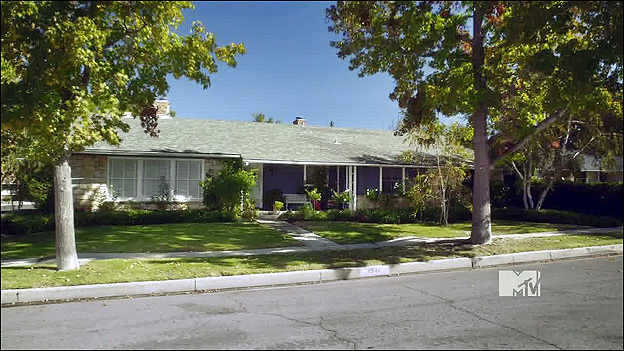 Robin's house is located at 18641 Ringling Street, in Tarzana.